Until you have your very own small human I think it’s fair to say you can’t truly appreciate the meaning of the word ‘tantrum.’ I appreciate adults can throw tantrums but in that scenario they’re usually knocked on the head pretty quickly by another adult telling you to pack it in, have a word or by you realising yourself you’re being a bit of a numpty. Unfortunately the small humans don’t yet have the developed brain to articulate their displeasure at something other than to literally throw their toys out the pram. Before I acquired my own small humans it’s completely true to say I didn’t appreciate the sheer scale of tantrums, how they could escalate in a millisecond, how ineffectual any attempts to de-escalate the tantrum could be (unless sweets magically appear) and how they could leave you feeling like a frustrated mess. Pre children if I saw a small human going nuts in the diary isle, confined in a trolley, with the parent seemingly oblivious I would wonder why they were continuing with their yoghurt selection instead of doing something/anything to ‘sort’ their child out. Well former judgy me apologises (how could I have known?) has done a complete 180 and now offers up a consoling non-verbal ‘I see you, you’ve got this’ smile. You are witnessing a brief snapshot into that parent’s day. You don’t know what that parent has already gone through that day, how many tantrums/battles have been fought and lost. If it’s a friend’s child proving uncooperative I’ve found that if I do something silly or ‘oh I bet you can’t do X’ they’ll stop to listen and prove me wrong. And visa versa friends have adopted this approach with my small human. Why is it they’ll play you up something chronic but smile angelically if X’s mum asks them to do something? Or usually in my case Nanny. I should add this small human is only 14 months old so unsupervised play in the garage is not going to end well for anyone. Joking aside though I remember when Toby started throwing ‘tantrums’ in public. I was absolutely mortified, felt like everybody was staring at me, judging me and felt woefully inadequate as a parent at a time when I was still learning the ropes and not brimming with confidence. I’ve since learnt not to pay any attention to other people, they probably aren’t even looking and if they are that’s their problem and not mine. I appreciate the later is easier said than done. I became intuitive to tantrum triggers and would try to avoid them. I was quite liberal in what I would let him do, experiment with and would only intervene if it was unsafe/unkind or like the example above the dogs were going to get it! I would try to nip the tantrums in the bud by using distractions e.g. oh look at that dog, what’s he doing? Oh look at this, etc. I’ve even pretended to talk to people and being inquisitive he would stop and come over to look. I found that if I reacted loudly or shouted that would be game over and we’d all be a crying dribbly mess. I personally found this really difficult as naturally I react quite quickly. Instead I would stand still and count to 10, enough to calm me down, and I would actually lower my voice to a whisper. He would have to stop making a noise to hear me and that would sometimes be enough to calm him down. This has also been a useful skill for me to learn personally so I don’t immediately react and shout when the dogs have eaten an unauthorised object for the millionth time. Sometimes you’ve just got to accept there’s nothing you can do and just let them get it out of their system whilst you’re there to cuddle them. As he got older he got more independent and wanted to do EVERYTHING himself. This is great but not when you’re trying to get out the door. If I rushed him he would get frustrated and angry so allow extra time for the shoes to be put on the wrong feet multiple times. As he got older again I’d give him choices. Both would ultimately be something I wanted him to do but rather than telling him, and perhaps this causing frustration, by giving him the choice he was deciding. As he’s got older again the tantrums seem to have decreased but have been replaced with negotiations. I am a lawyer. I’ve won my fair share of tough negotiations over the years with insurers and defendants. I have no tips on how to negotiate with a 4 year old. Sorry, unhelpful I know, just do your best! This is the technique I adopt from the minute he gains consciousness and the multiple negotiations commence. I can only comment up until the age of 4 years 9 months. I’d love to hear words of encouragement from owners of bigger small humans or alternatively if it gets more challenging at least equip me with advice. Forewarned is forearmed. 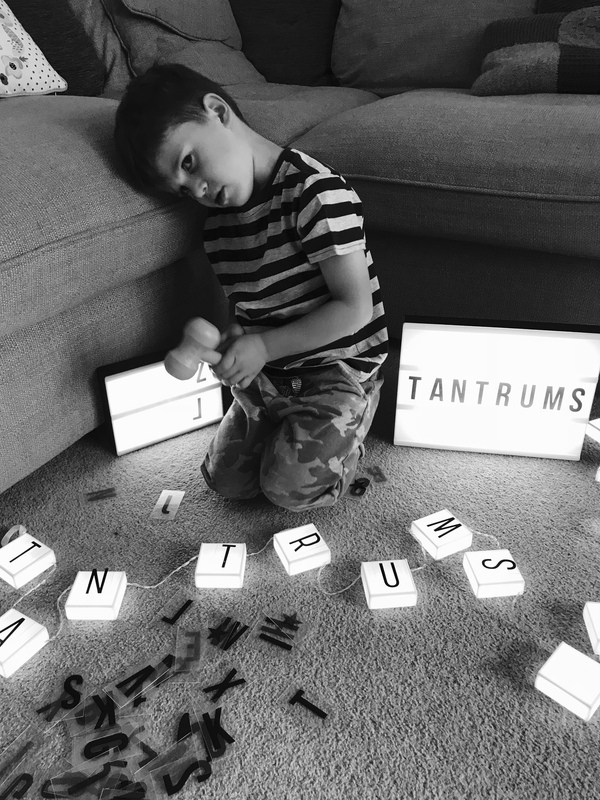 Do come equipped with your tantrum examples so we can all be prepared for what is to come! More importantly bring your tantrum busting tips.